There are many different baby gear items on the market and choosing the ones you need most can be overwhelming, especially for first time parents. But the baby crib is one item that is a must-have. While some parents choose to have the baby in their room for the first few weeks or months, eventually you will want a safe and secure place for your baby to sleep where they can learn to self-soothe and to sleep on their own. For parents who choose to start their baby out in a crib, it’s important to find an option that is both safe and comfortable. Most baby cribs can be used from the newborn stage through toddler age. Many people don’t move their child out of the crib until they learn to climb out and it becomes a safety concern. Because you will likely be using the crib for several years, it’s important to choose an option that is durable and designed to last. Baby cribs come in many different styles and finishes so you can easily find one that matches with your nursery decor. The following is a list of the 10 best baby cribs based on consumer report. 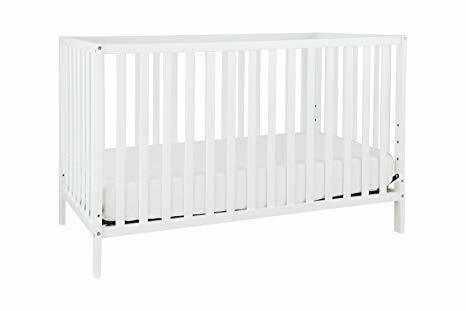 The DaVinci Kalani 4-in-1 Convertible Crib in white has a classic style that will look great for years. This crib has been Greenguard Gold certified to be free of harmful chemicals and over 360 VOCs. The crib can convert to a toddler bed, a daybed and a full size bed. The conversion kits for this bed can be purchased separately as you need them. This crib from DaVinci is finished with non-toxic paint in a multi-step process. It’s made of 100% sustainable wood from New Zealand and the finish is free of phthalates and lead. The crib comes with a 1 year warranty from the manufacturer. 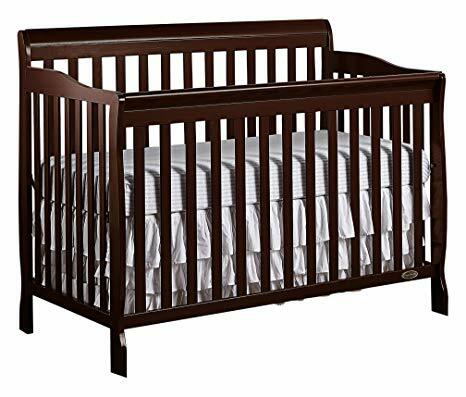 The Graco Benton 5-in-1 Convertible Crib has 3 different height positions for the crib mattress so you can adjust it as your child learns to grow and climb. The crib can be converted into the following: a toddler bed, a daybed, and a full size bed with headboard or with headboard and footboard. This convertible crib from Graco meets or exceeds all ASTM & CPSC safety standards and is also JPMA certified. It’s made from durable materials and has a stylish arched headboard. This crib requires some assembly and all the hardware is included. It comes with a limited 1 year warranty from the manufacturer. 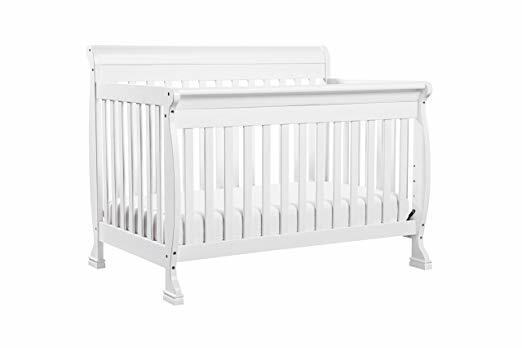 The Union 3-in-1 Convertible Crib has a classic white finish. This crib can convert to a daybed or a toddler bed. It has 4 different mattress levels so you can lower the mattress as your baby learns to stand. The cribs meets or exceeds all ASTM international and U.S. CPSC safety standards. This crib from Union is made with durable New Zealand pine wood. 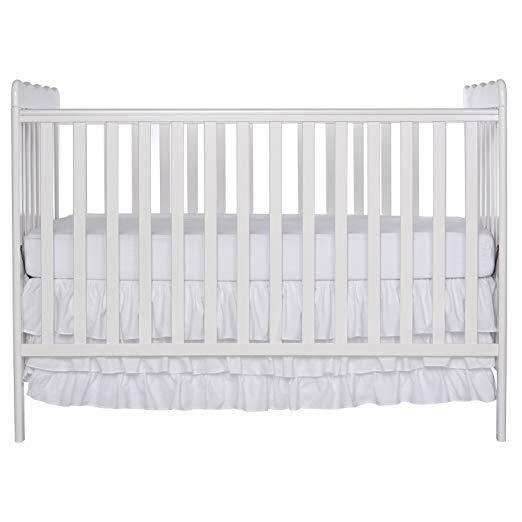 The white finish on the crib is free of lead and phthalates and is completely non-toxic. The crib is easy to assemble and it comes with all the hardware you need. The conversion kit for the bed can be purchased separately when your child gets too big for the crib. 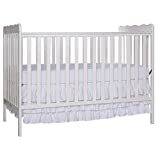 The Dream on Me Classic 3 in 1 Convertible Crib has a beautiful white finish. This crib can convert to a toddler bed or a daybed so it can accommodate your child as they grow. The toddler rail can be purchased separately when you need it. The crib is made of durable but lightweight pinewood. This crib from Dream on Me weighs 36 pounds when assembled. It has dual hooded safety locking wheels so you can move the crib around if needed. The weight limit of the crib is 50 pounds. It allows you to adjust the mattress to 3 different positions so you can lower it for safety when your child learns to stand or begins to climb. The Union 3-in-1 Convertible Crib in Grey has a modern and sleek finish. This convertible crib can be turned into a daybed or a toddler bed with a conversion kit that can be purchased separately. It’s constructed of pine wood from New Zealand which is sturdy and durable, but also lightweight for easy assembly with the included hardware. 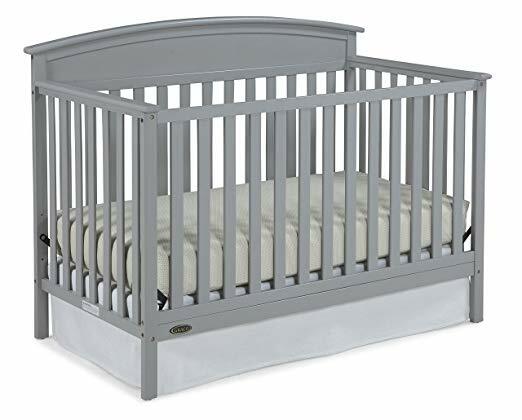 This crib from Union meets ASTM international and U.S. CPSC safety standards. The beautiful gray finish is free of lead and phthalates and is also non-toxic. This crib has 4 different mattress levels so you can lower the mattress as your child grows. The Delta Children Folding Portable Mini Baby Crib comes with the mattress that is specifically designed for use with this mini crib. This is ideal for travel or to keep at the grandparents’ house for when you visit with the baby. The crib can fold compactly and easily be stored in a closet, behind a door, or in another convenient space. This mini crib from Delta has casters so you can move it into place easily. It has a beautiful white finish that can coordinate with your other home decor. The mattress can be adjusted to 2 different positions for safety. The crib is constructed with sturdy hard wood so you can use it for many years. 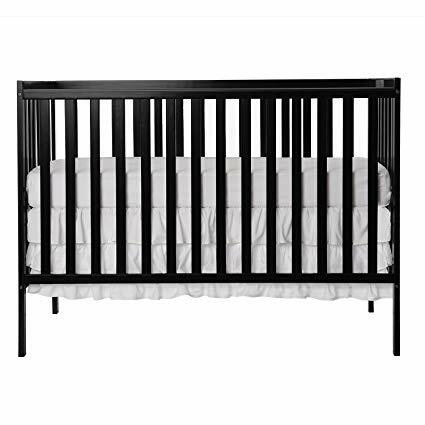 The Dream On Me Synergy 5-in-1 Convertible Crib has a sleek, black finish. This crib has the option to convert to the following setups: toddler bed, daybed, and full size bed. The coordinating guard rail and full size rail can be purchased separately as you need them. This crib from Dream on Me has two mattress levels so you can adjust the mattress as your baby grows. It comes with all the tools and hardware needed for assembly. The crib is made from durable materials and is finished with a product that is free of lead, phthalates, and is also non-toxic. 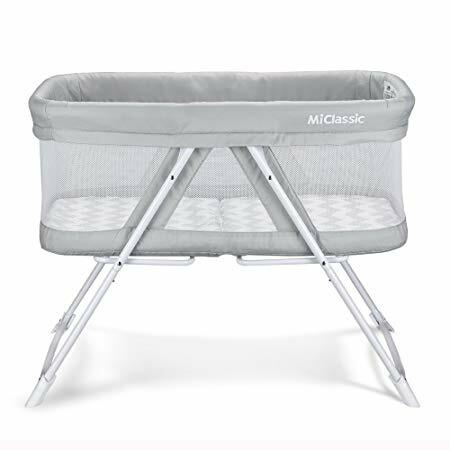 The 2-in-1 Rocking Bassinet and Folding Travel Crib is ideal for those who need a crib that can fit into a small space. 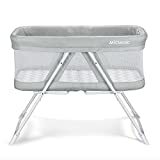 This folding crib and bassinet can be stored when not in use. It works well for family vacations where you won’t have access to a full-size crib. It’s easy to fold and unfold with a simple mechanism that allows you to set it up or fold it down in one second. This travel crib and bassinet has a rocking mode to help soothe your baby to sleep. It comes with a carrying bag so you can fold the crib away for travel or storage. The crib also includes the mattress that is designed to work with this crib. 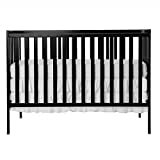 The Dream On Me Ashton 5 in 1 Convertible Crib has an espresso finish. It’s made of solid pine wood for long lasting durability. The crib can convert to a toddler bed, a daybed, and a full size bed. The conversion pieces needed can be purchased separately. When used as a crib, this unit has a maximum weight limit of 40 pounds. This crib from Dream on Me has a 4 level mattress support system so you can lower the mattress as your child grows. The crib comes with everything you need to complete assembly, including the required tools. The finish on the bed has been tested for harmful chemicals and it meets or exceeds safety standards. The Delta Children Emery 4-in-1 Convertible Baby Crib can convert to a toddler bed, daybed, and full size bed with headboard. It comes with the daybed rail and you can purchase the toddler bed guardrail and full size bed frame separately when you need them. 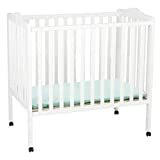 This crib from Delta has a classic white finish that has been tested for lead and other potentially toxic chemicals. It also meets or exceeds the safety standards designed for children’s furniture. The crib is made of strong and sturdy wood so it will last for years. You can adjust the mattress to 3 different heights as your child grows. Choosing the right crib for your space can be a difficult decision. There are many different options available and they come in several different colors and finishes. Once you decide on the style and color you want, you should be sure to find a crib that has been safety tested. 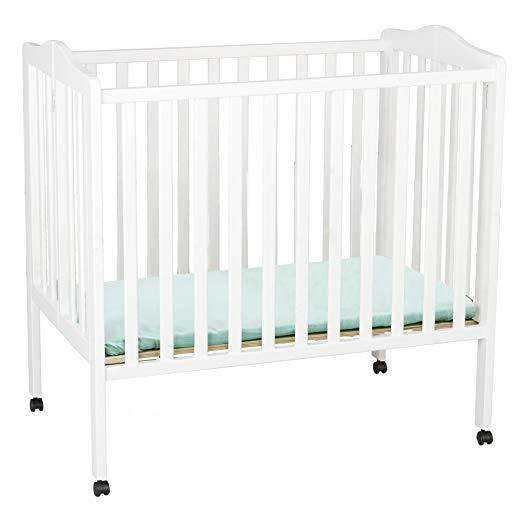 Most cribs on the market have been tested for lead and other toxic chemicals which can be very important as some children will chew on crib rails, especially when teething. Most cribs allow you to adjust the mattress level to 3 or 4 different heights. This is important as it will help keep your child safe from falls as they learn to stand and climb in their crib. Once they begin to climb out, if you have a convertible crib, you can then change the bed to a toddler bed for safety. Some convertible cribs can be used for many years and will also convert to a daybed and a full size bed.